Like many Harvest Moon games, the house in Back To Nature is important as it is the only place where you can save your progress; i.e. the journal by the bed. 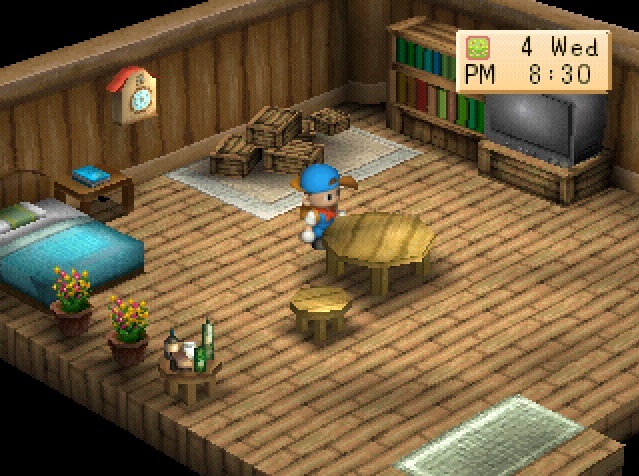 Many Harvest Moon games treat getting new furnishings as a simple extension of remodeling or “upgrading” as they often call it in game. 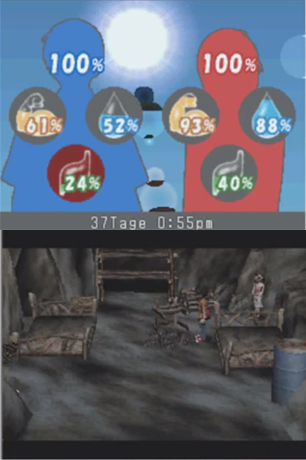 Now some Harvest Moon games make house upgrading a means of showing how well off you are at playing farmer. By the time you can afford the biggest house upgrade, odds are you have a few years under your belt. Heck, A Wonderful Life takes this further and simply nets you a house upgrade every few years for big family situations like when you first get married or have child who has aged past babydom. Back To Nature, on the other hand, makes house upgrading a key component to getting married. To round out games where the player’s home or base are key to progress, look at the game Knights of Pen & Paper on the PC. The entire setting of the game entails sitting in a single room where you dungeon master some players together on a table top adventure. The backgrounds change and the dungeon master might turn into a scientist, but you are still in someone’s house at the end of the day. I heard that you can even find items and bring them back with you into your real world home. I’m going to shoot some low hanging targets and call out many video games for using in-game collectables as a means to pad play-length. Indie games have been having a frenzy of this with filling their perhaps even good 5 hour games with collectable cards and stars. They often feel hollow, as they are usually just tick mark or an increased number. But some games make collecting doo-dads at least a nice visual novelty. 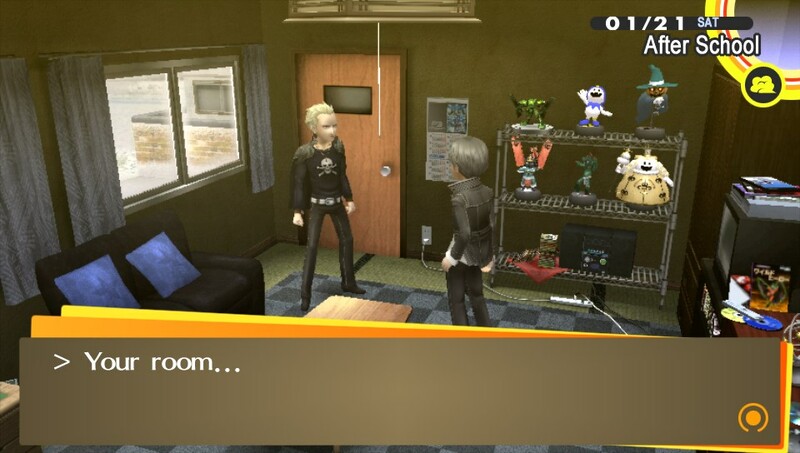 For instance, Persona 4 lets you collect figures and model kits through crane games. From there, you can organize your various Jack figures in whatever fashion your heart desires. The aptly but still confusingly named Simpsons’ game, The Simpsons Game from 2007, let you free roam the house. The only real reason for such a privilege was so you could see where your collectibles were showcased, as Homer’s novelty beer bottles were located in the garage and Lisa’s novelty Malibu Stacie’s are in her room. What’s funny is how the game left fade marks on the shelves to simply mess with those of us who are the compulsive hoarder times. 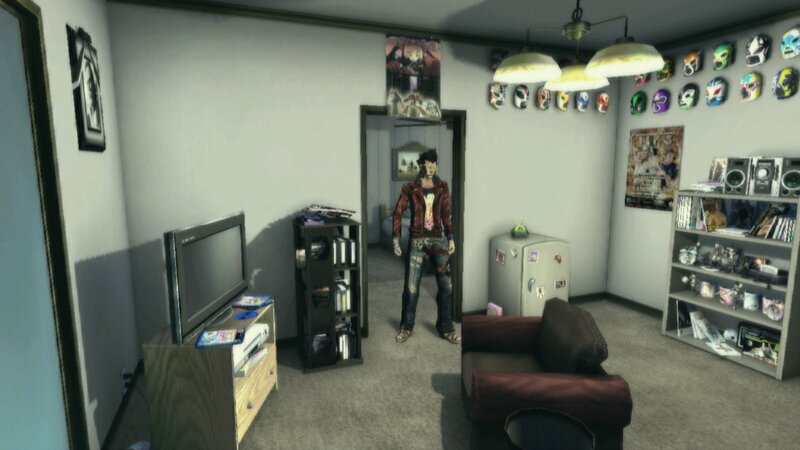 I plan on delving deeper into all the cool stuff No More Heroes 2 let you do this with Travis Touchdown’s apartment, but I just wanted to briefly mention that the Luchador masks you collect and hang on the apartment walls in No More Heroes 1. 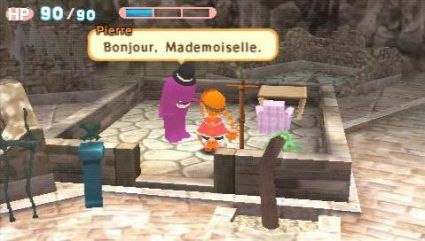 Gurumin: A Monstrous Adventure takes the cake, as one of protagonist Parin’s missions outside of rescuing her monster friends is locating and redecorating their houses. They don’t own much, but what they do own gives neat insight into each monster’s character and hobbies. Finally, we have the games where simple interior decorating is an added bonus. 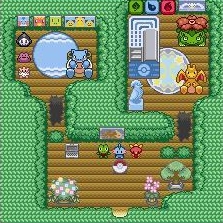 How about starting with my first true experience with games letting me decorate my player’s home? Going back to the original Pokemon Gold and Silver on the Game Boy Color was a big part of my 2nd grade life. See, as a kid with parents who both worked full time, I was in afterschool care up until I could get a car pool started. This was where I originally befriended an older 6th grader, who I remember battling with Pokemon mostly for Gold and Silver’s mystery gift function. More battling with my Lugia meant I could get great stuff like a Snorlax plushy or a Jiggly Puff poster for my character’s room. No More Heroes 2 leads the pack though by hiding in mission items ranging from mecha unit mobiles, surf boards, one of those door frame curtains from Travis’ favorite anime Pure White Lover Bizarre Jelly, and with the craziest of all including the complete retiling of Travis’ three room apartment. Those Luchador masks collected in the first game even make a return, lined up like disembodied trophies. No More Heroes 2 really let me feed my compulsive need to cover all white walls with objects. To make a contrast, starting with Mass Effect 2, you could collect model space ships and parade them in Shepard’s living quarters. Softer accents of personal interest made to jive with the professional feel of Shepard’s commanding cabin, not like the color explosion of Travis’ merch lined Hotel: No More Heroes home. To close this article out, I want to cause a little fervor with a game most people think of when it comes to interior decoration: i.e. the entire Animal Crossing series. Let the record show that I, Franklin Raines, am a man who jells with all other games which feature even the smallest interior decorating, but find Animal Crossing boring and only palatable for a few hours at a time. To me, the interior decorating examples listed above are never the core meat and potatoes in their respective games. Persona 4 is about going to school and fighting monsters in your T.V. late at night, Harvest Moon is about taking care of a farm, and Lost In Blue is simply about survival. None of them are solely about interior decorating, not like how Animal Crossing structures all your effort into tracking down furniture that look like oranges and lemons so you can get digital brownie points with the Happy Room Academy home owner’s association. It’s a game about slowly paying off one debt to Tom Nook so you can purchase a minuscule house expansion that then requires another huge debt. I am talking multiple accounts of abusing the town’s bank system so you can get 50 years’ worth of interest on your bells simply to pay for a second floor. 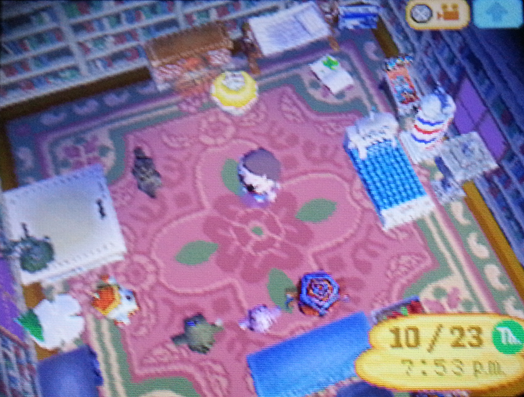 A big problem is that your items often mean nothing (excluding those NES emulators in the first Animal Crossing, as those were pretty great), as you are simply decorating a room to which none of the town’s various giraffe, wolf, or bear home owners will ever compliment on how great a mastery of feng shui you have. I’ll close by saying that simply putting some interior decorating be it with a house or simply a player’s room, in your game has me instantly interested. But when it comes to Animal Crossing and it’s player’s house, the only enjoyment I ever got was placing all my belongings against the entrance and windows so it looks like a Gyroid (Animal Crossing’s iconic musical furniture) uprising has successfully invaded my home. I invested far to much time making this visual…my god…maybe I really am playing Animal Crossing as it was intended! This entry was posted in Editorial, Past Generation and tagged Animal Crossing, Gurumin: A Monstrous Adventure, Harvest Moon Back To Nature, Interior Decorating, Knights of Pen & Paper, Lost In Blue, No More Heroes, No More Heroes 2, Persona 4, Pokemon (in general), The Simpsons Game (2007), video game bedrooms. Bookmark the permalink. ← Oddity Game Seekers’ Tumblr is up!